The Illinois Green Party has aligned with the anti-airport group STAND (Shut This Airport Nightmare Down) as they call for the state to halt spending on land in eastern Will County. They say the state's plan, to use eminent domain to take two parcels totaling 500 acres, is simply not justified. Locator Map of Will County, Illinois, 1853. At the same time that Gov. Pat Quinn talks about controlling spending, he continues to support squandering $105 million to condemn family farms at the site of the proposed Peotone airport in the far southern reaches of the Chicago Metropolitan Area. The reality is that the state is $13 billion in debt. George Ochsenfeld, president of STAND, who is also running as a Green Party candidate for State Representative in the 79th district, expressed outrage that Quinn's land purchases are going forward despite the fact that the FAA is at least two years from making a decision whether or not to authorize the project. He says spending millions to purchase land at this time is a gamble. According to the state's official website, IDOT recently spent $2.2 million to purchase a 160-acre property. Their pending 500-acre purchases will likely cost millions more. "Buying the land now may bring political benefits for the airport's sponsors, and there may be some short-term financial benefits for contractors and developers," said Ochsenfeld, "but this airport is going to be a hard sell for travelers, and it has already done significant damage to long-time residents of the region." Two eminent domain cases are pending for a 300-acre parcel and a 200-acre parcel. The cases will be heard in the Will County Circuit Court in Joliet. State officials continue to make the claim that jobs are the impetus behind the airport, yet there is little evidence to suggest that the number of jobs they predict will ever materialize. The state continues to make bloated claims of job-creation. Using old data and outdated jobs forecasts for an expanded 22,000-acre project during a robust economy and healthy aviation industry, state officials continue to blur the line between aviation reality and the fantasy that a new airport will bring economic prosperity to some of the poorest regions of the state. "The airport plan has been marketed by its proponents as a jobs program, but it's doubtful that the jobs will ever come," says Scott Summers, Green Party candidate for Illinois Treasurer. "Today, the State of Illinois is spending $3 for every $2 it takes in. We're basically broke, and yet the governor is gambling on a project that does not have local support, federal approval or any commitments from the industry that is supposedly going to be using it. "Illinois has many examples of unnecessary and under-utilized infrastructure, from the MidAmerica Airport near St. Louis to the Thomson prison. We ought to know by now that building unnecessary infrastructure means the jobs may never materialize as promised," continued Summers. "This airport promises to be yet another long-term financial burden on the taxpayers." "The state does not have financing to build the airport or for necessary surrounding infrastructure," said Ochsenfeld. "Not only that, the airline industry is against the project, O'Hare is being expanded, the Gary airport is being expanded, the airlines are in disaster mode, with O'Hare having the lowest number of flights in 15 years." "We have more than 30 resolutions and referendums from surrounding villages, townships, other units of government, and from citizens' groups against the project," Ochsenfeld said. That doesn't include the thousands of signatures on petitions that have been delivered to the state through the dozens of years this project has been stuck in perpetual planning mode. The State of Illinois plans to acquire a total of 22,000 acres (34 square miles) of mostly prime farmland, much of which is owned by 4th- and 5th-generation local farmers. "This is a crime against future generations, who will need productive soil," said Bob Mueller, a Will County native and candidate for State Representative, in DuPage County's 47th district. "Rural Will County is rapidly disappearing, and with it will go, not just a way-of-life, but the self-sustainability of the region. Yet for many politicians involved, it may take a major food or energy crisis before they realize the folly in paving over highly productive farmland." Gubernatorial candidate Rich Whitney, a long-time opponent of the Peotone airport project, said: "We as a society need to be moving toward more energy-efficient and less-polluting and potentially non-polluting modes of transportation, like high-speed rail, not promoting more of the same wasteful modes of transportation that have created the crisis. "The Peotone Airport is a horribly misguided investment of public capital, that may enrich a few speculators and politicians but will likely end up being a white elephant — with taxpayers left to cover the inevitable losses and all of us paying for the consequences of unsustainable modes of transportation." I do not condone writing mills, those quantity vs. quality online writing sites that pepper the internet with works of well-intentioned writers who are paid far too little for their efforts. My criticism is of the sites, much more than of the writers. In some cases, the content is worth far more than what the writer ever receives in compensation. Such was the case in a recent article by Peter Bella, for Examiner.com. Entitled "University Park or Gorky Park? ", Bella discusses the behavior of a village official in University Park, a south suburb of Chicago. This story is worth noting, because it was not the subject of Chicago's mainstream media. Congressional candidate Isaac Hayes, R-Park Forest, a congressional candidate who is mounting a challenge against U.S. Rep. Jesse Jackson, Jr., D-Chicago was invited to a private networking event in his neighboring town of University Park, according to Bella. The April 7 event was hosted by Jennifer Day of Daylight Media, Bella explained. He went on to describe how University Park Village President Al McCowan threw him out of the event because he was a Republican. McCowan is a well-known supporter of Jackson, who was not at the event. "About one hour into the event, Hayes was angrily asked to leave the event immediately by University Park Mayor Alvin McCowan," Bella wrote. "The mayor then brought the hostess to tears with a tirade about inviting a Republican to the event. It should be noted also that many of Mr. Hayes staff members are White and were treated in a bigoted manner (sic) my the mayor and his staff." Both McCowan and Hayes are black. “I guess this Mayor doesn’t believe his community has a right to decide for themselves, considering Rainbow Push’s material was placed in full sight and not taken down”, said a Hayes spokesman, according to a Hayes Press Release. “If Jesse Jackson Jr. had a sponsored table here tonight it would be business as usual”. Bella concluded, "Alvin McCowan is disgusting, despicable, deplorable, and detestable. Evidently he thinks he can just do what he wants, when he wants, and get away with it. He is right too. No one in the local Chicago media have covered this so far. There has been no condemnation, no editorials, nothing. University Park is a little bit of the old Soviet Union right here in our own backyard." Speed bumps may impact Indiana's new Illiana Expressway law in the form of the communities most impacted by it. Earlier this month, Lowell, IN councilmen opposed the project even before the ink on the legislation had dried. Lowell councilmen voted not to support the plan until more is known about the route the road will take. Lowell is situated east and slightly south of Beecher. Tuesday officials in Lowell drafted a letter to Gov. Mitch Daniels, state senators and representatives citing a need for additional information on the project. They noted lack of local input into its planning. Michael Jordan, a Lowell-area developer, who opposes the Illiana Expressway, wants to see Lowell officials have an audience with legislators to express their concerns. Jordan believes that supporters, who refuse to pinpoint the exact route of the Illiana Expressway, are using a "divide and conquer" strategy. He indicated the move is designed to divide landowners who oppose the road, segregating them from others who live along a different route. It would be easier to defeat three unconnected small groups than one large group with momentum on its side. Jordan suggests the strategy may have come about after the northern route of the Illiana into Porter County was met with tremendous opposition. He explained that when Indiana Gov. Mitch Daniels saw how intense the opposition was, he dropped the plan. "It was a single route," Jordan said. A similar strategy has been used before, and by some of the same people. In the early 1990's the proposal to build a new regional airport near Peotone was buried among five sites being eyed for development. Many believed that the Peotone site was always the favored location by decision-makers. One of the most vocal supporters then and now for the proposed airport at Peotone is the South Suburban Mayors and Managers Association. At that time, Barbara Sloan was the SSMMA's transportation director. Today, she is behind the Illiana Feasibility Study, by Cambridge Systematics. In another Indiana town – Cedar Lake, east of Crete – there are also some concerns about a lack of input into the project's planning. Once solidly in favor of the project, Cedar Lake officials may be starting to have some doubts. Council members were recently put on the spot when a resident, Sharon Pacific of Hanover Township, polled them about their support for the road. Pacific lives on 10 acres that one of the proposed routes could impact. Pacific not only has a stake in the plan, but she questions the merits of the road. According to the Northwest Indiana Times, Cedar Lake Council President Dennis Wilkening indicated that the council's sentiments may have shifted. The Illiana Feasibility Study identified three potential routes. One is north of Cedar Lake. Another is between Cedar Lake and Lowell. The connection in Illinois for both of those routes would be between Crete and Beecher. A third route is between Route 2 and the Kankakee River. In Illinois that translates to south of Beecher. The Illiana has been billed as a reliever for truck traffic on the Borman Expressway or Interstate 80/94, but Lowell officials are among many who question whether truck drivers will travel an estimated 55 miles more and pay additional tolls to drive on it. With regard to the previous post in CHBlog, Illinois contingency asks Gov. Quinn to abandon South Suburban Airport, about officials from the Rockford area calling Illinois Gov. Quinn's plan for Peotone development "wasteful." What is most revealing are the insightful comments that follow. It is no wonder the Peotone Airport and Illiana Expressway have been so intrinsically linked. Not only was the Illiana a part of the early studies on the Peotone Airport, but the players remain the same. I thought I was watching an airport meeting. Barbara Sloan was the former Transportation Director for the South Suburban Mayors and Managers Association. Randy Blankenhorn was a former IDOT employee. U.S. Congressman, Don Manzullo, (R-IL) along with several Illinois state senators and representatives wrote a letter to Illinois Gov. Pat Quinn yesterday, urging him to stop wasting state funds on a new airport at Peotone in eastern Will County. Despite Illinois' budget crisis, Quinn recently allocated another $100 million to the Peotone project. Illinois taxpayers have shouldered the burden for ongoing feasilibity studies for a new airport since 1985 when a concept plan from twenty years prior, were envisioned. The latest allocation of taxpayer funds would include just the purchase of additional land. The state owns only about half of what would be needed to build a new airfield. The estimated $5 billion project does not include any of the infrastructure that would be needed to turn a farming community into a metropolis, what would be needed to make an airport viable. The present landscape of the area proposed to house the Peotone airport contains farmsteads and historic farmsteads, which use well and septic systems. Tar and chip roads are far from that which could accommodate airport traffic or even heavy construction traffic. Nearby towns and townships have long been on-the-record as being opposed to the construction of a new airport. Residents have fought the proposal since 1987. In addition to opposition from the people who would live with a new airport, all of the major airlines have said they would not use an airport at Peotone. "We believe it is unconscionable for the State of Illinois to continue to waste precious taxpayer resources on this unnecessary project as the state struggles with record budget deficits and debt," Manzullo wrote. Citing last week's agreement between the major airlines and the City of Chicago to move forward on the O'Hare Modernization Program, the Rockford congressman said, "it is even more egregious and unnecessary for the state of Illinois to continue to spend scare taxpayer dollars on the South Suburban Airport (Peotone Airport) that the airlines have said they do not want or need." Manzullo named Rockford as an alternative airport to Chicago's O'Hare and Midway airports. He reiterated the statement by the Illinois Department of Transportation, the same agency pushing the Peotone project, that the Chicago-Rockford International Airport, "RFD is the airport with the greatest potential for development of passenger service and the ability to maintain passenger service." The existing RFD is the alternative to development at Peotone, he said, pointing out that RFD offers passenger air service now handles one million passengers. It can easily serve five million passengers per year. While Peotone remains in the study phase, unapproved by the federal government , RFD has made more than $150 million in federally-funded capital improvements, including the construction of a 10,000-foot runway, net international terminal, and Category-III Instrument Landing System capable of accommodating any plan that flies. In conclusion, Manzullo and state signatories—Sens. Dave Syverson, Tim Bivins, and Christine Johnson, along with State Reps. Jim Sacia, Joe Sosnowski, Dave Winters, and Robert Pritchard—asked Gov. Quinn to "abandon these wasteful plans at Peotone." They invited Quinn and Illinois Secretary of Transportation Gary Hannig to meet with them at RFD to see first-hand the potential that exists there. was featured on "The Fleecing of America," a news segment meant to highlight wasteful government spending.Called the glass palace on the prairie, MidAmerica St. Louis Airport, as it is now being called, is visible from miles away, as it rises above the flat land of Mississippi River country. Twelve years after it opened, there has been some use, but nothing like the glowing predictions that sold a sleepy southern Illinois community. MidAmerica St. Louis remains largely empty. The modern, two-story glass and steel terminal is impressive. But don't look for a place to buy a ticket to any destination. Not only are there no ticket agents, no tickets, but neither are there any destinations. The baggage conveyor is idle, void of luggage. Restrooms are spotless, virtually unused. The terrazo floors still shine like the day they were installed. There are occasional aircraft on the runway, mostly military planes destined for the adjacent Scott Air Force Base. But if Illinois officials envisioned a "build it and they will come" scenario, it didn't work here. Few came. And those who did didn't stay.MidAmerica was billed as a reliever airport for Lambert-St. Louis International, just across the river in Missouri. MidAmerica never achieved crystal ball predictions, dubbed 'Gateway to Nowhere'. When proposed MidAmerica was estimated to cost $220 million. It was to bring economic prosperity to southern Illinois and eastern Missouri by employing 600 people during its first year. Passenger predictions from the day forecast that 1.1 million passengers would be served by MidAmerica by the year 2000. But in actuality, the cost was approximately $307.5 million. And there were ancillary costs as well, such as the 8.6-mile extension of the MetroLink light rail system from Belleville Area Community College to MidAmerica that cost $88 million. The entrance roads, parking lots, final landscaping and pavement markings needed an additional $3.5 million. Wetland mitigation cost $1.8 million and $13.3 million was needed to connect MidAmerica to Scott Air Force Base. Finally, in the spring of 1998, MidAmerica got its first paying customer. Langa Air, an aircraft fueling and maintenance company began a small operation there, but it was short-lived. The company later relocated back to Lambert International at St. Louis. By summer, three Trans World Airlines jets had landed at MidAmerica bringing about $80 in landing fees each time. MidAmerica was the alternative during bad weather for TWA traffic. Lambert was its hub. But that arrangement ended when TWA was acquired by American Airlines in 2001. In September, of ‘98, after learning that Lambert was planning a $2.6 million expansion program, State Rep. Tom Holbrook, D-Belleville, a member of the General Assembly filed a complaint with the FAA. He had hoped to block the expansion, by stating that MidAmerica should be used to relieve air traffic congestion. Other legislators came on board. Holbrook’s actions were applauded by the residents of Missouri who opposed the expansion. They would be most affected by additional air traffic. Ironically, despite MidAmerica being touted by then Gov. Jim Edgar in previous years, he was said to favored the expansion of Lambert. He said MidAmerica was meant as a reliever for Lambert, not a replacement. The next month, the expansion was approved. It was billed as the largest public works project in St. Louis’ history. As MidAmerica celebrated its first birthday, it had seen about 3,000 take-offs and landings, though most of those were military planes. There was little fanfare. In the summer of '99 ex-Gov. George Ryan signed a bill to create an enterprise zone around MidAmerica Airport and to offer tax breaks to companies that would move to the area and to create jobs. Even without regular business at the airfield, the costs for Mid America continued to rise. There was a request for $2.5 million in improvements for 2000. They included a fence to keep deer off the runway, and about $50,000 to replace runway lights, which were too short to meet federal requirements. Local taxpayers would pay $756,000; the state contributed $852,000 with the balance paid by the federal government. The annual operating budget at MidAmerica was $2.2 million. In 1999 it was increased to $3.4 million, with a million for salaries of security guards, maintenance workers, managers and other personnel. Part of that expense included marketing costs of $161,000 to four companies. Today, operating costs have risen to $4.7 million and includes 14 full time and two part time employees. That includes a director, assistant, and workers in resources, operations, planning and engineering, maintenance, and ground services. The budget is overseen by the St. Clair County Public Building Commission. In August, 2000 a restructured Pan American Airlines began flying out of MidAmerica. Its first flight, Aug. 16, was to the Gary/Chicago International Airport. But as luck would have it, the return trip, that was supposed to be 45 minutes long, was delayed. The pilot was forced into a holding pattern for five hours and was later directed to land at Lambert in St. Louis. Three months after September 11, 2001 Pan Am suspended its flights at MidAmerica and soon thereafter closed up shop for good. For a time, charter flights were offered to the Caribbean. But that didn't last long either. 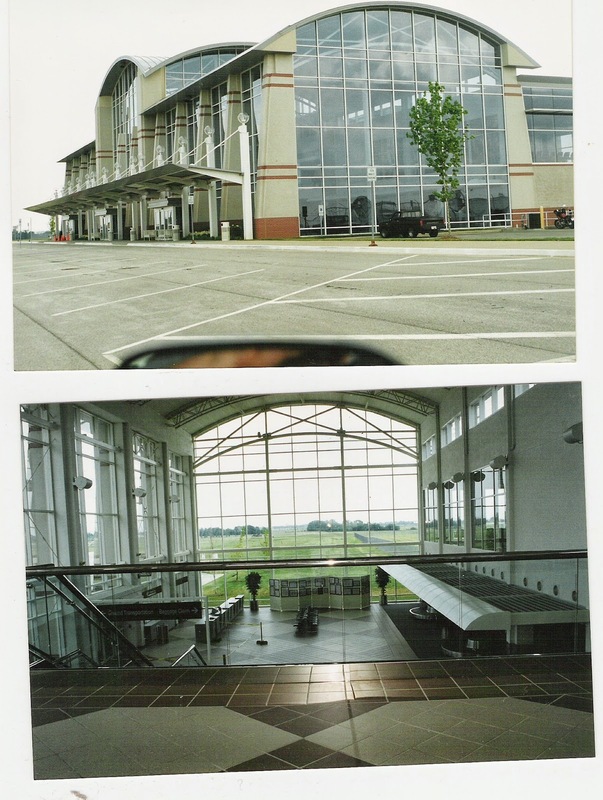 Little changed at MidAmerica until June 2005. Eight years after it opened, MidAmerica celebrated its 10,000th passenger. That was about 980,000 passengers shy of the predicted goal expected five years earlier in 2000. Then Allegiant Air took flight each week to Las Vegas and Orlando, Fl. airport supporters remained optimistic. Then Allegiant Air cut its Florida business because it was unable to compete with the low fairs offered by Southwest Airlines at Lambert. Even the longtime St. Clair County board member Craig Hubbard, R-O'Fallon, admitted that building the airport may not have been a good idea. Acknowledging that MidAmerica never achieved its goals, he said he doubts he would do it all over again, if given the chance. Michael Boyd, a longtime Colorado-based aviation consultant warned officials about the potential for MidAmerica twelve years ago. He feared it would not be successful. Supporters are now interested in turning the airport into a cargo facility. They think that idea could turn things around at MidAmerica. They point to weekly flights that began in 2008 to import flowers from South America. Boyd recently told them there is nothing to turn around, because they have built something that simply isn’t needed. MidAmerica has never even approached the inflated expectations of its aggressive marketing campaign. To people in eastern Will County, the MidAmerica saga and the state's proposal to build another airport in the farm fields near Peotone are eerily similar, even down to the cast of characters who have used the same playbook. IDOT's consultant, TAMS, was responsible for both projects' highly-criticized pie-in-the-sky projections of users, operations, enplanements and job creation. Both projects were started by Gov. Jim Edgar. One project came to fruition under his administration while the other still has not. But there may be a second chance since Edgar's chief of staff, Kirk Dillard, who helped his boss do some of the political heavy lifting in those days, happens to be running for governor in the Republican primary. But the biggest commonality between MidAmerica and the proposed Peotone project is how they both have bled Illinois taxpayers. Critics of Peotone issue the reminder from a 19th century philosopher, "Those who cannot learn from history are doomed to repeat it."